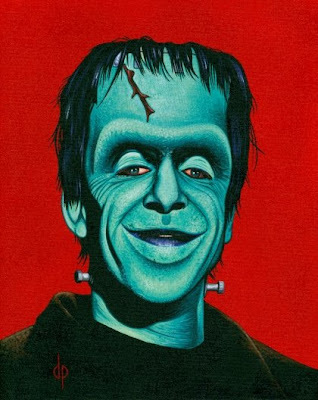 Boris Karloff as Frankenberry! Genius! TDSH: Why do you believe you were attracted to monsters as a subject? DP: I don't really have an answer to that...my first interest as a child were comic books. My earliest drawings were copies of comic book pages. I was mainly into Spider-man until the Incredible Hulk TV series, then I became fascinated with the Hulk. I think possibly the horror elements of that series, mainly the Frankenstein and Jekyll/Hyde themes made me take interest in horror films. When I was in fourth grade, I remember buying a book at a local bookmobile titled Movie Monsters by Alan Ormsby. I still have it to this day. 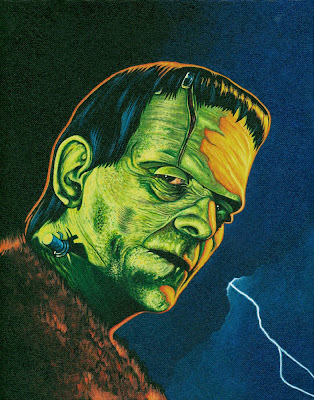 That book, more than anything else, made me the monster fan I am today. I was fascinated by the photos from these old films, and wanted to know more about them. TDSH: Did your love of monsters ever get you into trouble as a kid? DP: Oh yeah. I remember being 8 years old and realizing one day that the fresh-cut grass stained the soles of my feet green. Being the Hulk fan that I was, I immediately realized I could look just like my idol! I set about rubbing clumps of grass all over my body, and cut up my good dress shirt. As I was roaring and terrorizing my poor sister in the back yard, my mom looked out the window and saw her son covered from head to toe with grass stain, wearing his now ruined dress shirt. The Hulk met his match that day, let me tell you. TDSH: Which cereal do you like best: Frankenberry, Count Chocula, Booberry, or Fruit Brute? DP: Gotta go with Count Chocula. I'm a bona-fide chocoholic. TDSH: What's the best cereal premium ever, in your opinion? DP: I don't really remember any, except for this cool submarine that I got in a box of Cap'n Crunch. You put baking soda in it, and it would dive and come back to the surface over and over. Guess I'll have to go with that one. TDSH: Your love of monsters and your sense of humor impressed me when I saw you with your paintings at the Monster Bash convention. So I'm curious-- what are your favorite horror films, and what are your favorite comedies? 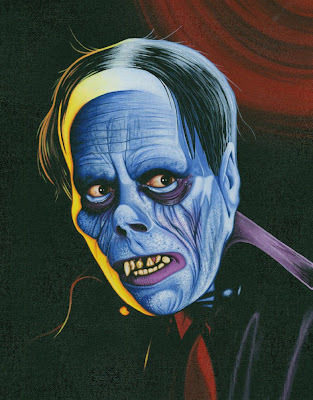 DP: My favorite horror films are all of the Universal Monster films, with Phantom of the Opera (1925) being my favorite. I tend to like really stupid comedies, like Team America. TDSH: Do you have any hobbies besides painting? DP: I collect and build classic horror garage model kits, and have an extensive DVD collection of classic genre films and TV series. I have a large collection of memorabilia from the Incredible Hulk TV series, including posters, lobby cards, pressbooks, stills, etc. from over a dozen different countries. At over 300 pieces, it is believed to be the largest, most comprehensive collection in existence. TDSH: Don't you have a display planned for Monster Bash 2009? DP: Yes. I'll be bringing my entire collection of Incredible Hulk TV memorabilia, which will be on display in the first ever Hulk Museum!! I'm really looking forward to seeing Lou Ferrigno at the Bash, and hope he enjoys the display also. TDSH: Tell me some of the items you'll have there for people to see. 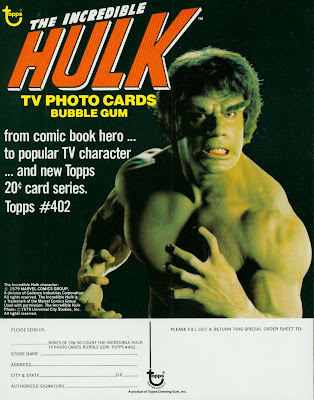 DP: My Bride of the Incredible Hulk one sheet [a poster from the European release of a feature made from episodes of the series], my The Incredible Hulk Australian daybill, [a 13 x 30 inch advertisement for the theatrical release of the TV pilot film] and my SUPER RARE Topps 1979 bubblegum card order form. TDSH: Where has your art been seen? DP: My model work has been featured in Amazing Figure Modeler and Modeler's Resource magazines, and I have done two painted magazine covers, one for the October 2006 issue of Big Reel, and one for Mature Focus. I was surprised and honored when my illustration for Mature Focus was chosen as the Best Cover Illustration of 2007 by the North American Magazine Publishers Association (NAMPA). I never saw that coming, and didn't even find out about it until three months after it had happened. The artist is always the last to know! TDSH: Any artists whose work you strongly dislike? DP: Only one...Saul Bass. I think he is the most overrated artist in history. His movie posters remind me of the stuff you see moms hanging on their refrigerator doors. TDSH: Who are your favorite artists, and do you think they have influenced your style? DP: My favorite artists are James Bama, Drew Struzan, Basil Gogos, Lorraine Bush, and my good friend Fred Chesnes. All of them have influenced my style, in that even with their own unique styles they have achieved a level of realism with their art that I strive for. I honestly cannot bear to look at my own work from even five years ago...I am always evolving, always learning new techniques, and striving for that sense of realism in my work, even though the subject matter may be fantastical. After many years of trial and error, I think I'm finally on the right path to where I want to be with my art, and I hope to continue improving. I want to really push the limits of what I can do. DP: Well, as you figured out, my painting was definitely inspired by the fantastic work of Bob Larkin. 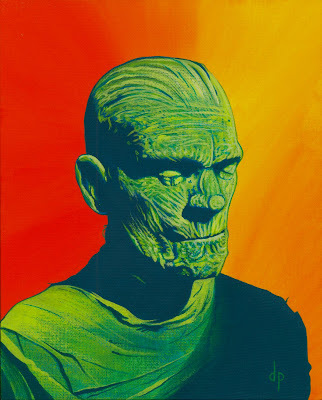 I have been trying for years to develop my own distinct style, influenced by Basil Gogos of course, since he is the Michaelangelo of Monsters. Unfortunately, nothing I ever did had the look I was aiming for. On Gogos' own advice after seeing my work, I tried loosening up, but that's just not how I paint, and everything I tried like that looked sloppy and somehow unfinished to me...like a rough sculpture. I discovered Larkin's work through some of the Marvel magazine covers he did, and immediately recognized many similarities between my own style in his work. I analyzed the cover he did throroughly, and thought I could improve on it by making it a stand alone portrait of Karloff. I felt the busy background scene in Larkin's painting shifted too much of the focus away from the monster. The result is a painting which I feel is at least as good as the cover that inspired it. I found it very easy to adapt my style towards what Larkin had done. For my next painting, I decided to do Lon Chaney as the Phantom, [see above] with only the original black and white photo for reference. This would be the test. Could I duplicate the technique again without any reference? The answer was yes. Looking at the Phantom, you could easily believe that Bob Larkin himself painted it. These two paintings have been a major turning point for me creatively. I feel I have finally achieved the look I have been striving for, and I'm looking forward to exploring it further. TDSH: Clearly, you are very thoughtful about your technique and what suits your style. It's impressive to hear you describe your striving to accomplish your best. Since your portrait work shows that you are a major monster fan, you must love Halloween. What are you doing All Hallow's Eve? TDSH: Just like the Voodoo Queen and me! Are you nervous? DP: Nah...it's gonna be a blast! We're really having fun planning everything. I'm pulling out all the stops this year and making my most elaborate costume ever: Doctor Octopus! TDSH: Wow. All the more arms to hold your bride with! Thanks for the interview Dwayne, and for sharing your art and your thoughts here at The Drunken Severed Head. And congratulations to you and your bride-to-be! Great interview and great artwork!! !